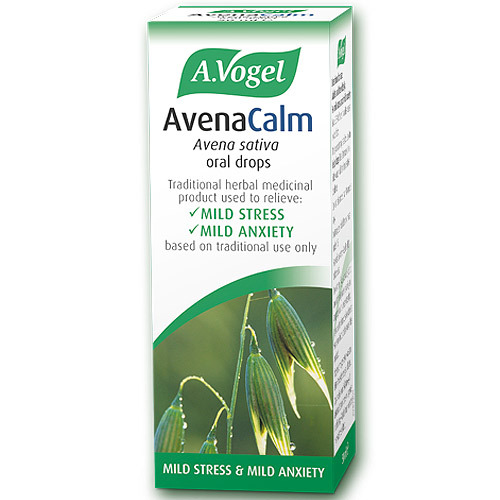 A Vogel AvenaCalm Avena Sativa Oral Drops is a herbal remedy which can be useful for symptoms of mild stress, anxiety and an aid to sleep. Made from the leafy part of an oat plant, this product is organically grown and freshly harvested to produce herb tincture. AvenaCalm is a traditional herbal medicinal product for the temporary relief of symptoms associated with mild stress such as mild anxiety, stress and to help sleep. Avena Sativa is more commonly known as oats. It is the extract of the above-ground parts of the place which is used to make AvenaCalm. 1ml of oral liquid contains: 940mg of tincture from the pressed juice of fresh oat herb (Avena sativa L.) (1:1.2). Extraction solvent: ethanol 51% v/v. 1ml of AvenaCalm oral drops is equivalent to 37 drops. This product contains 51% vol ethanol (alcohol), i.e. up to 327mg per 30 drop dose, equivalent to 8.26ml beer (less than a tablespoon) or 3.44ml wine (less than a teaspoon) per dose. For mild stress and mild anxiety: Adults and the elderly: Take 25-30 drops twice daily. For sleep: Adults and the elderly: Take 30 drops in a little water 30 minutes before bed. Do not take more than 90 drops a day. Not for use in children or those under the age of 18. Do not use if you are taking another medicine which is affected by alcohol. Do not use if you suffer from coeliac disease - The protein content of this product is not known. Use within 4 months of opening. Do not use this product if you notice a change in colour. It should be a clear liquid that is yellow-brown to green-brown in colour. This product is intended to help you relax. If you feel drowsy do not drive or operate machinery. Below are reviews of A Vogel AvenaCalm Avena Sativa Oral Drops - 50ml by bodykind customers. If you have tried this product we'd love to hear what you think so please leave a review. This is ideal for my needs and I use it daily. I have also started using it for my 4 cats as it is therapeutically beneficial. I give them 5 drops daily. A Vogel AvenaCalm Avena Sativa Oral Drops is a herbal remedy which can be useful for symptoms of mild stress, anxiety and an aid to sleep. Made from oat plant, this product is organically grown and freshly harvested to produce herb tincture.